Below pictured are Daria McCoy and her sons, who recently took part a night walk of Benbulben Mountain, Co. Sligo organised by Sligo/Leitrim Mountain Rescue in the name of organ donation awareness. Daria's husband had a double lung transplant. We would like to sincerely thank them for their efforts, which attracted attention from the Sligo Champion newspaper. Events like this go a long way in spreading the ever-important message regarding organ donation. 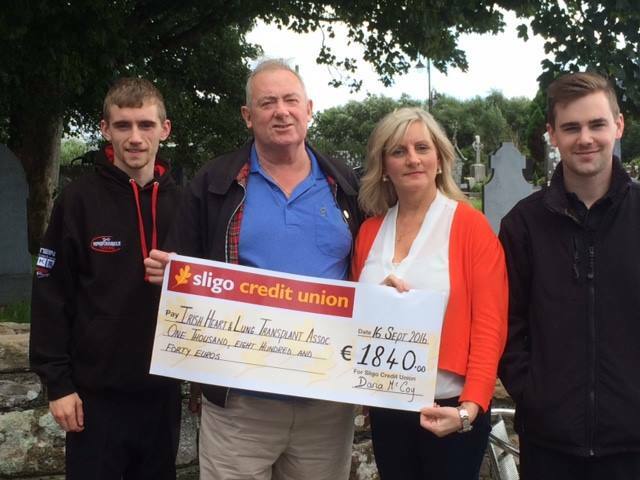 Gerry Scully, IHLTA secretary, is pictured receiving the cheque from Daria, Mark and David McCoy. Would you be interested in a "coffee morning" with other transplant recipients? Based on feedback we have received, the IHLTA are currently seeking to gauge interest in social gatherings for our members. This might consist of meeting for coffee (possibly in the Mater on clinic mornings) or on more 'neutral' venues, even at weekends. The latter would appeal for members outside Dublin, who could meet in their own time (at weekends, etc). Such gatherings would not necessarily consist of humdrum medical chat, but rather an opportunity for individuals with a shared interest to meet and socialise. An event page has been set up on our Facebook profile for those intending to attend the IHLTA visit to the Circle of Life Garden in Salthill, Galway on Saturday September 17 (2pm). 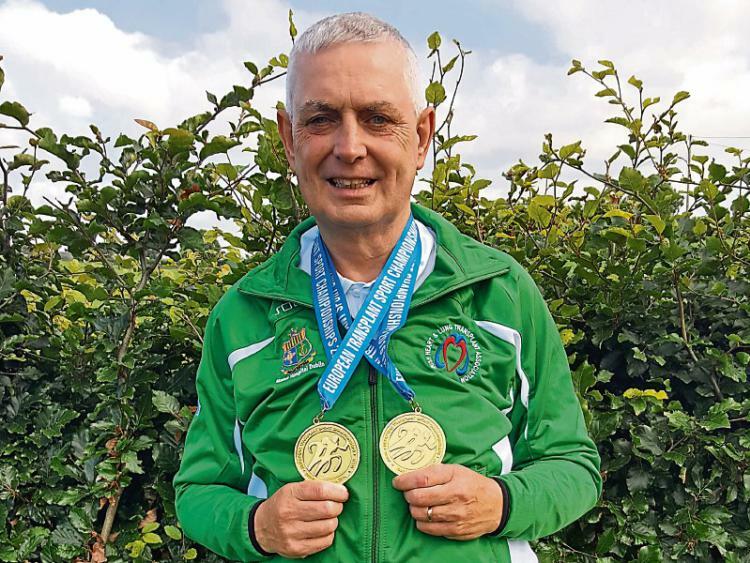 Sixty year old Liam Ryan from Thurles was celebrating last week after securing a double gold in golf and athletics at the 9th European Transplant Games following a heart transplant operation in 2014. Liam, who says he is “overwhelmed by the support” he has received in the town, has heaped praise on his family, friends, medical team and former work colleagues after they rallied around him while he suffered with ill health for over a decade. “Having received an organ donation means I could return to full health and participate fully in every aspect of life again,” he says. The former referee and keen Peake Villa supporter first noticed his health deteriorating in 2000 and soon after he was diagnosed with cardiomyopathy or a weakening of the heart meaning he had to retire from his job as a postman in the town. “I was a referee for ten years so I kept fairly fit but I could feel my health declining. I was very low in energy and fatigued all the time but couldn’t understand why,” explains Liam. Following his diagnosis Liam’s health improved through a combination of medication and having an internal defibrillator fitted; however in 2010 his health began to decline once more. A health assessment in 2014 showed that he urgently needed a transplant and he was put on the waiting list. “I knew that if I didn’t get a transplant I wouldn’t have lived another 6 to 12 months,” he says. Fortunately luck was on Liam’s side and within six weeks he received a call to say a match had been found and a helicopter was organised to airlift him from Thurles Rugby Club to the Phoenix Park. A final round of tests at the hospital confirmed that Liam was the closest match for the organ and the operation was given the go ahead. Thankfully the operation was a success and while recovering in hospital Liam heard about other transplant patients who were preparing for the 2014 Games in Vilnus, Lithuania. After a tough 12 month recovery period, Liam eased himself back into sport once more joining Thurles Golf Club and the gym in the local leisure centre where he gradually built up his fitness levels. “The games were a wonderful experience but I never expected to get a gold medal. I told myself wouldn’t it be great to take bronze or silver in the 4km road race so to bring home the gold was something else entirely,” said Liam who also took gold in golf for the 19 plus handicap event. “I want to thank my wife Joan, children Louise, Bill and Leanne, my aunt’s Bridie and Peg who said countless prayers for me for all their help and support, Premier Health Clinic Thurles, my doctors Paul Ryan and Margaret Longeran, Ryan’s Chemist and all the staff at the Mater who looked after me so well throughout my treatment,” he said. “I would also encourage people to sign up for organ donor cards. It can be a hard topic to discuss but it can help others so much. After many years of not being able to live life to the full I’m definitely making up for lost time,” he adds. Please see our Facebook page to view photo galleries from this summer's Heart and Lung Transplant Games in Finland.